As one of the most architectural productive country, China aggregates 2 billion m2 of new building area every year, consuming about 40% of the world’s concrete and steel. However, on the flip side of the new building fever, there lie the rubble and remains of other “older” buildings: people tear down four-star hotels to build five-star ones and bulldoze newly developed construction sites before they are even finished. Vienna Wood Community in Hefei City(合肥维也纳森林花园小区), died before born on Dec. 10th, 2005. The community covered about 20,000 m2 construction area with the main structure raised to 58.5 m high. 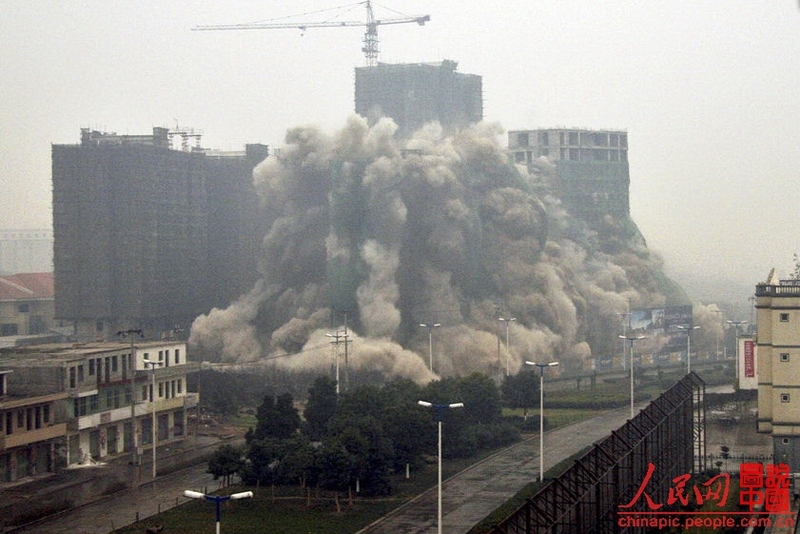 The tens of millions yuan worth building was blasted as a whole when its 16th floor was still under progress. According to local government, the community punctuated the central divide of Hefei City, blocking the scenery between Huangshan Road and Dashushan Mountain. They couldn’t straighten Huangshan Road unless the community was out of the way.